Did you join in or initiate a International Day of Peace celebration with your family, school, or community last week? Did you know that September 21 is the International Day of Peace? If it was missed in the hustle of life, no worries. You can celebrate and encourage peace everyday. We started marking “Peace Day” in our family a few years ago, when we cut up an old sheet and the kids painted Peace Flags to hang in our yard. One still adorns our play structure. This year, we found ourselves exploring the Jamestown Settlement and reflecting on how the Powhatan Indian, English, and African cultures of early 17th century Virginia lived in times of peace, as well as during conflict. While it was a stretch to say we marked Peace Day in a significant way this year, we made up for it a few days later at home when we had some friends over for some learning fun focused on one of the prerequisites for peace (inner peace, family peace, world peace – any kind of peace!) – we had a celebration of a child’s pure heart. We like to imagine a child’s heart as a mirror. If free of dust and dirt, it can reflect the light of the sun. When pure and free from unpleasant thoughts and behavior, a child’s heart is a heart at peace. Happy. Contented. Kind. Loving. What a beautiful condition and source of joy to the child and all those around her. To help us explore the idea of and encourage having a pure heart, we shared songs and stories. Then we painted heart-shaped boxes that each child could take home and fill with anything to help them remember and cultivate their pure heart – whether a small mirror, a flower, a prayer, or poem. 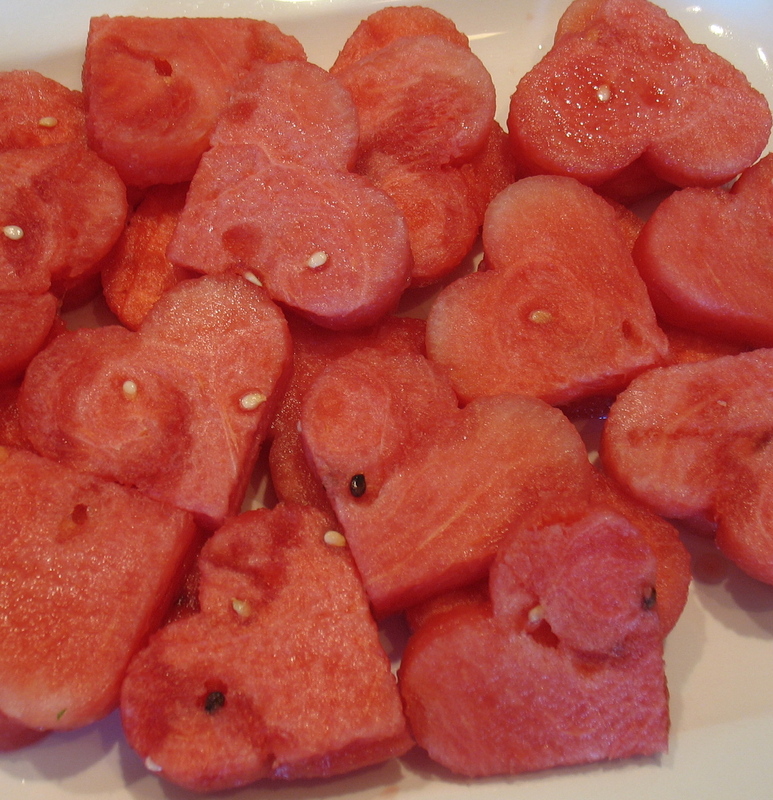 But the hit of the day was probably the heart-shaped watermelon slices that the kids nibbled on. To make these fun treats, just slice watermelon into discs, then cut with a cookie cutter. I wish I’d thought of this sooner! It worked just great, and I can’t wait to try it with other shapes for other themes. 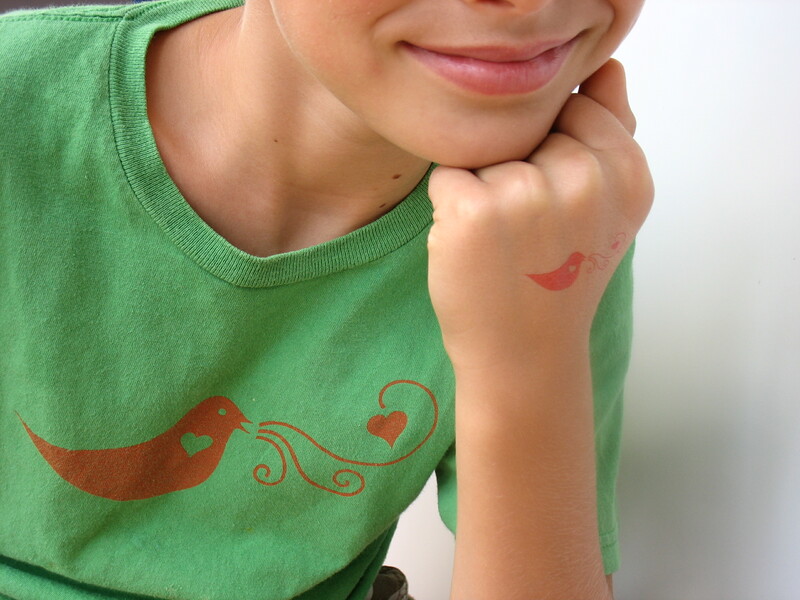 Finally, the kids decorated their hands with “With All Your Heart” tattoos. Everyone left with smiles on their faces, heart-shaped boxes still dripping with paint, and peaceful hearts. There are so many inspiring ways to celebrate the International Day of Peace, which we hope to incorporate into our lives in a more intentional way in future years. As we continue learning about this United Nations day and its 20-year history, we’ve found the International Day of Peace Education Resource Packet an interesting resource. A short list of creative ideas for kids to celebrate Peace Day can be found here. Also be sure to check out Pinwheels for Peace, an art-based project started in 2006 that generated more than 4 million whirling peace pinwheels around the world last year. Need something simpler that you can enjoy watching grow over the years? Plant a peace tree! What are your ideas, experiences, and resources to help celebrate and create a culture of peace? Categories: Have Fun, Virtues, World Citizenship | Tags: International Day of Peace, Peace Day, Pure Heart, World Citizenship | Permalink.